Donald Healey joined in partnership with the Austin Motor Company in 1952. His plans at the time were to produce a medium-high performance sports car that would be affordable to the masses. Healey was a brilliant designer and engineer and his belief was that the market needed a two-seater that fell somewhere between the MGTD and the Jaguar XK 120, the former being a primitive, uncomfortable car and the latter being an expensive, luxurious and exceedingly temperamental one. Healey's first sports car, the 100-Four, turned out to be quite well received. Although not terribly powerful, the four's torque was 150 LB/ft and that made the car seem faster than it really was, its 0-60 time being 11.2 seconds. The auto magazines of the era loved the Healeys and the car's future seemed assured. In the late 50s, Austin canceled its four-cylinder engine program in favor of a new 2.6 liter six. The company's belief was that the six could be improved over time and its smoothness was far superior to the four. Healey responded to the new engine by calling the new car the 100-Six. Several modifications had to be made to the existing Austin-Healey to accommodate the new engine. The size of the six required a taller hood and this in turn necessitated a design change in the grille. An integral hood scoop was designed to minimize the massiveness of the hood. Suspension changes had to be made as well, since the new engine was almost 100 pounds heavier. Things were going well for British sports cars during the early-mid 60s, but there were demons in the works. It would take many, many pages here to explain what happened and there is little space for that, but a little taste of the industry-government machinations is worth mentioning. 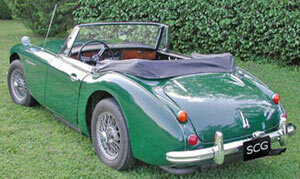 In 1952, as we know, Healey joined with Austin Motor Company. Also that year, Austin's arch-rival, Morris, merged with them to form British Motor Corporation. This led to a 15-year spate of politics, back-stabbing and dirty-dealing that ended up in 1967 with the formation of British Leyland This "marriage" led to awful products like the Jensen-Healey and the TR7. These led in turn to the demise of the British sports car industry and left only Jaguar and Rover to produce vehicles for U.S. consumption. Eventually over 70,000 Austin-Healeys were produced, many of which ended up here in the States. Each successive year brought improvements until the last year — 1967. By that time the Austin-Healey 3000 MKIII, as it was called, sold for $3565, including overdrive, but with seat belts offered as optional. The 3000 was powered by the much-improved 177 cubic inch six which produced 148 horsepower. Zero to 60 was now possible in 9.8 seconds and its top speed was 122 mph. Other big improvements were windup windows and a curved windshield. This made the Big Healey far more comfortable for grand-touring but it was still an aging design. Autocar said, "....repeated face lifts can no longer wholly hide the ravages of time and progress." In spite of being fun to drive and universally acknowledged as beautiful, the 3000 was canceled at the end of the 1967 model year. During the three years that the MKIII was produced, 17,703 of them were sold. 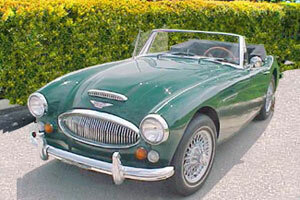 No successor to the Austin-Healey was announced, nor was any announcement made. The factory simply said that no more would be made. Sometimes it's better that some things get cut off short in life rather than linger on. This is the case for the Austin-Healey 3000. In point of fact, the cars were noisy and very uncomfortable to drive, especially compared with cars of the late 60s. Also factual, the MGB and Sunbeam Alpine were better cars all around and sold for less money. Anyone who has ever tried to put up a Healey folding top would agree that it must have been designed by a sadistic Druid. All things considered, though, the Austin-Healey is a true classic. It's gorgeous, responsive and the stuff of memories, and the history of the automobile would have been lacking had it not been produced. You can own one these days because there are a lot of them still extant. They are pricey, though, so plan to spend a good $30,000 for a decent driver.